Owning a thriving saltwater aquarium is a dream for many aquarists. While keeping freshwater fish is extremely fun and rewarding, there’s just something magical about the exotic beauty of saltwater fish. These are the fish that capture our hearts: from the cute Finding Nemo clownfish to the exquisite seahorse, there’s something to interest every fish keeper! We’ve compiled a guide to the best saltwater aquarium fish and categorized them by care difficulty, so you’ll be able to pick and choose which ones are best for you and your fish tank. Remember to let us know in the comments if we’ve missed out your favorite! The Ocellaris Clownfish is the most common and popular in the clownfish family — probably because they’re peaceful and easy to care for, while also bearing a striking resemblance to the main characters in Finding Nemo! They’re perfect for beginners and a great fish to start off your saltwater aquarium. Royal Gramma basslets are another highly popular breed of colorful saltwater fish that are sure to fit in easily to your aquarium. They’re beginner friendly thanks to their being small, peaceful and easy to care for. It’s also known as the fairy basslet thanks to its incredible colors. The Black Cap is another basslet that’s a little more unusual than the Royal Gramma, but just as suitable in a beginner saltwater aquarium. It may be a little more aggressive towards very small invertebrates. Also known as the Snowflake Moray Eel, these are some of the most commonly kept eels in saltwater fish tanks thanks to their ease of care and docile personalities. They are known for escaping, however, so make sure that you keep that lid on tight. Plus, we think they’re pretty cute! The Yellow Striped Cardinal fish is a small, peaceful and colorful saltwater fish that is very popular among beginner aquarists. It can be a little shy, so make sure to provide it some hiding areas in sea grass and the like. There are a variety of different Dottybacks available, the most vibrant of which are the Purple and Bicolor Dottybacks. 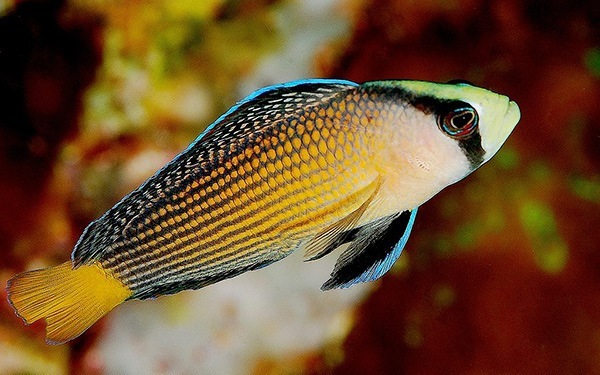 Above is the unique and exotic saltwater fish, the Splendid Dottyback. It can be a little aggressive in smaller tanks, but otherwise we think it’s a good choice for a committed beginner. They’re generally pretty peaceful and even provide a parasitic cleaning service if you have any larger reef fish in the tank. The Damselfish family are known for their stunning deep blue coloration, and are very popular among saltwater aquarists. The Yellow Tail variety has exactly that — a yellow tail — plus it’s a little less aggressive than other Damselfish and thus more suitable for beginners. Squirrelfish are a relatively unusual breed of saltwater fish, most distinguishable by their large eyes and the clicking noise they make as they swim. They’re ideal for beginners as they’re easy to care for and non-aggressive, although they can grow to a reasonable size. As they can be a little territorial, we recommend them for intermediate aquarists looking for more of a challenge. How unique looking is the Triggerfish?! They’re known for being able to rotate their eye balls independently too. There are around 40 different Triggerfish variations, with the one above being the Picasso Triggerfish. We think they’re best for intermediates as they can have a bit of a nasty temper on them, although they are hardy and generally easy to care for. Groupers are a popular choice for saltwater aquariums, although they can be a little aggressive so a more experienced aquarist is preferred. They’re known for their large, stout bodies and drooping mouths. They require lots of space to thrive, as they produce a lot of waste and like open swimming. The Longnose Batfish is an interesting looking, walking saltwater fish that you’ll find spends a lot of time at the bottom of your tank. While it’s relatively peaceful, it does have more complex care needs that mark it out as suitable for intermediate aquarists and above. We love this exotic saltwater fish, and truthfully it could be the right fit for a committed beginner’s aquarium, as well as the more experienced. The reason we’ve put it here, however, is that it requires a large tank and has venomous spines. A beautiful and colorful saltwater fish, the Longnose Hawkfish is a great addition to an intermediate tank. It is a jumper, so make sure you have a secure lid, and it can be aggressive among others of its kind so best to keep it as a single. And here’s Dory from Finding Nemo! This is the Blue Tang. They’re best for more experienced fish keepers as they require plenty of room and can be aggressive in certain circumstances. Sweetlips — a remarkable name for a remarkable fish. The variation picture above is the yellow banded Sweetlips. They’re part of the Grunt family, and actually make grunting sounds with their teeth and gas bladder. Although they start small, they can grow very large and require lots of open swimming space. Anthias are a popular and much desired saltwater fish, and we think the Lyretail variation is an excellent pick for intermediate aquarists. They come in beautiful color assortments, including orange, red and purple. Take a look above at the Cleaner Wrasse in action, doing what they do best. But keeping a cleaner wrasse alive and thriving in your tank is a very difficult task indeed, so should only be attempted by highly experienced aquarists. These saltwater fish won’t necessarily accept substitute food other than what they can clean off the other fish in your tank so are highly susceptible to starvation. Lionfish have venomous spines and are predatory so experienced care is a must when handling them in a saltwater aquarium. While it’s unlikely their venom will prove fatal to a healthy adult, young children and those allergic may be at risk. Butterflyfish are some of the most beautiful and colorful freshwater fish we can think of, that can be spotted hanging out among coral reefs when they’re not in a home aquarium! There are plenty of variations within the Butterfly species, with some of them easier to take care of than others. The Copperband is strictly for elite fish keepers. Owning a saltwater puffer fish is the goal for many aquarists and the Spiny Box Puffer is considered to be the holy grail. It does require lots of room for swimming so make sure that you’re prepared to buy a very large tank for it. If you are looking to add a catshark to your home saltwater aquarium, you really need to be a highly experienced fish keeper. Cat sharks can get very large, require plenty of space and can be aggressive to boot. This gorgeously unique pipefish is a beautiful addition to a saltwater aquarium, but they can be difficult to care for thanks to their complex feed needs. Having said that, they’re reasonably easy to keep and peaceful. And now we come to what everyone wants in their saltwater aquarium — a seahorse! Beautiful and unique, these are best kept to experienced aquarists who are content with a seahorse only (and possible pipefish) tank. The most common and easiest to care for is the Kuda seahorse. We really wanted to include a ray on this list of the best saltwater aquarium fish, but you should be aware that this is really for very experienced hobbyist level aquarists only. Not only do you need a huge tank, but you need a lot of patience as these babies have very exacting water quality requirements. Hardy, they ain’t. Plus, you know, they’re venomous. Phew! And there you have it — our complete guide to the best saltwater aquarium fish!